Top Mexican drug lord Joaquin `El Chapo' Guzman has escaped from a high security prison outside Mexico City for the second time. He made his getaway via a 1.5 km long tunnel that originated in his cell. Guzman, who headed the infamous Sinaloa Cartel, was last seen near the Altiplano prison's showers at about 20:00 local time on Saturday (01:00 GMT Sunday), the statement from The National Security Commission says. The authorities later checked his cell and found it empty. A search operation is ongoing in the area and flights have been suspended at the local Toluca airport. The drug lord escaped via a tunnel, which began in his cell, the national security commissioner said as cited by Mexican Times Co News. About 1.5 km long and 10 meters deep, the tunnel had ventilation, oxygen tanks and stairs. It was led to a house under construction. The officials also found a motorbike on rails, which was used to remove soil during the construction of the tunnel. At least 18 prison officers have been taken to Mexico City for questioning over Guzman escape, the authorities said. 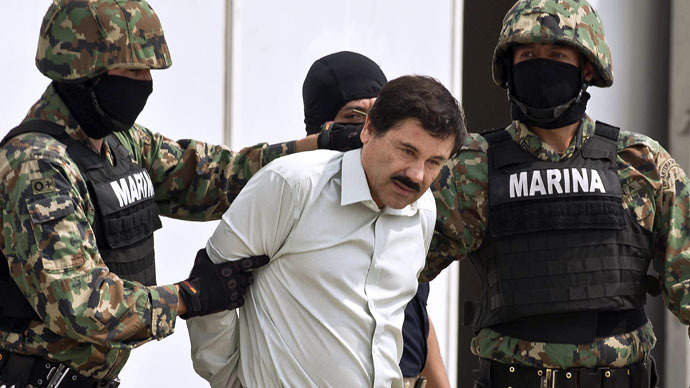 Guzman, known as one of the world’s most powerful organized crime bosses, was imprisoned in February 2014. Until his arrest, the US Department of the Treasury considered him "most powerful drug trafficker in the world." The Sinaloa Cartel has reportedly smuggled billions of dollars worth of cocaine, marijuana, and methamphetamine into the United States, and fought brutal wars with other Mexican gangs over turf and drug trafficking routes. Guzman who is wanted by the governments of Mexico, the United States and by INTERPOL, also escaped from a federal maximum-security prison in 2001 after being captured back in 1993.